Intermittent fasting (IF) is a way of dieting that involves mixing periods of regular eating with periods of going without. Many people use IF to lose weight or improve their health in other ways. There are several types. The alternate day method of IF involves fasting every other day. This could mean completely abstaining from food or eating a limited amount of calories, up to around 600. A study and a later review in the Journal of Clinical Nutrition showed several benefits of fasting on alternate days. Researchers reported that the biggest disadvantage of alternating days was that hunger on fasted days remained high even over time. This can make it difficult for those who struggle with self control when it comes to dieting. However, this form of IF doesn't require eating any specific types of foods on normal eating days, which makes it ideal for those who enjoy the occasional indulgence. The modified fasting regimen is akin to what you may have experienced during a mini-detox or cleanse. The fast lasts for a full 24 hours, two days or more each week. The 5:2 Diet, for instance, involves five days of normal eating and two days of calorie restriction. You can choose any days for fasting; they don't have to be consecutive. Calories are reduced drastically, for a total of 20 to 25% of normal intake. While specific types of nutrients may be different depending on the person fasting, a modified fasting regimen or detox may involve limiting intake to only liquids, a juice cleanse, or fresh veggies on fasting days. On the other days of the week, normal eating resumes. Research shows that modified fasting has the same benefits as fasting on alternate days. 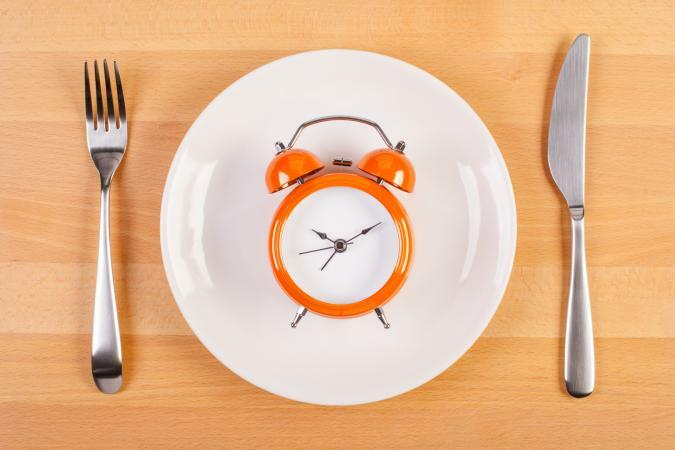 Time restricted eating is an approach that, according to the Journal of Translational Medicine, is not only gaining in popularity in the weight loss community, but is also an effective tool for reducing body fat. The idea is for dieters to go a certain number of hours without eating in order to reduce the total amount of calories consumed. The 16/8 regimen involves 16 hours of abstaining, including the time you are sleeping, with meals spread across the other eight hours of the day. Daytime fasting is when you fast during daylight hours and eat only after sundown. While the principles are different, this type of fasting resembles varieties of religious fasting in the way that practitioners can only have water until after sundown. Biblical fasting is the opposite. You can only eat during the daytime. Time-restricted eating is a popular option among the weight loss crowd, specifically because it is the most practical when paired with an exercise routine. Meal times can be planned around workouts for optimal energy output during strength training and cardio sessions. Fitness and nutrition professionals, such as Precision Nutrition, warn that women could experience negative effects from intermittent fasting. These may include amenorrhea (loss of menstruation, a symptom of hormone imbalance), malnutrition, and excessive weight loss. The conclusion that women's IF experiences are different from men has not been proven through research. In fact, studies cited in these claims are usually based on research conducted on rats, not humans, or on women who suffer from anorexia but aren't on a regimen of intermittent fasting. Fasting has actually been proven to be beneficial for women on a variety of health measures. A study in the Journal of Midlife showed that fasting improved both reproductive health and mental health in female participants. It also reduced the risk of cancer and bone disease. Besides these benefits, the only difference women should expect from intermittent fasting is that they will probably consume fewer calories overall. Scholars warn consumers not to take intermittent fasting lightly. Adding to the existing arguments against fasting, they note that IF is dangerously close to becoming a fad. Practicing it incorrectly may result in malnutrition and negatively affect your health. On the other hand, there are numerous benefits to fasting that you may want to take advantage of. If you decide to try IF, seek professional guidance so you'll know you're dieting safely and effectively.